The Ski Trab Titan Vario is the pinnacle of performance amongst the race-weight, tech-binding crowd. The toe piece and heel piece are each unique and category-leading. When paired together, they offer an incredible binding that’s capable of being skied harder than anybody thought a sub-200g binding could. A titanium spring joins the toe-wings and allows them to operate independently of one another. This means the opening force applied to one wing isn’t automatically applied to the other wing like in most traditional toe pieces. This increases retention when skiing bumpy, hard snow so you can feel comfortable pushing harder without the need to lock the toes. The lack of coiled springs also shaves weight while thwarting dangerous ice buildup underneath said springs. This means you have time to take in the view, plot your line, or even eat a few calories while your buddies are still working on clearing the ice from their bindings to ensure proper wing-closure. 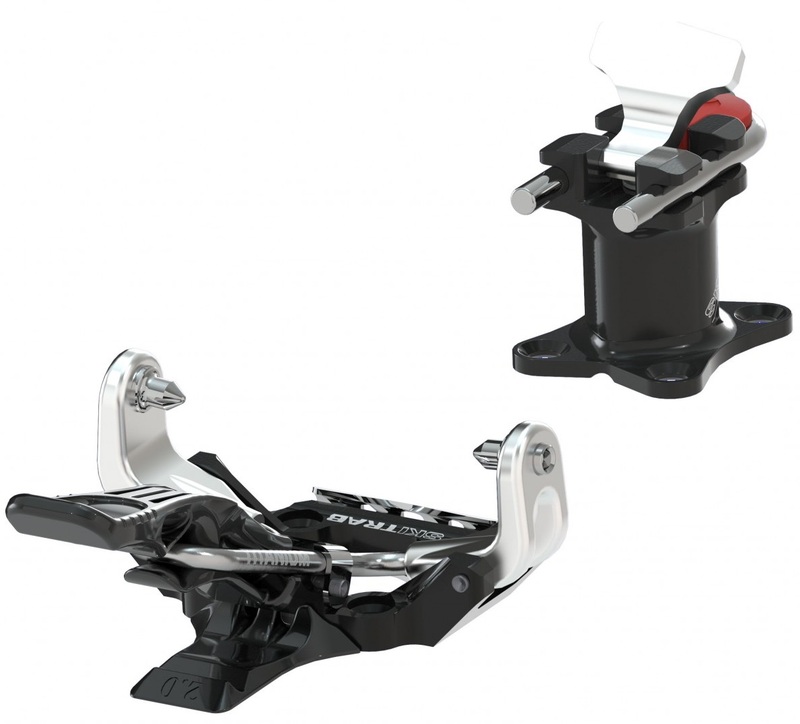 The heel pieces appear nondescript but hidden underneath the cap is some pretty impressive hardware that allows the heel piece to rotate 21.5° to either side while applying significant return-to-center force. What this means is you’re able to load the skis up that much harder through rough snow and the heels will continue to snap you back to center while other race heels would have let go. 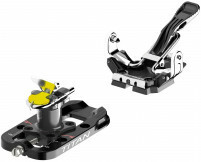 For skiers that ski as hard as they climb, the Titan Vario is without a doubt the binding of choice. Three lateral and vertical spring options to fine tune your release values, R8, R10, or R12. Independent toe-wing operation and lateral-heel elasticity offer the most reliable light-binding retention on the market. Titanium toe spring doesn’t ice up underneath and prevent proper closure, meaning safer skiing. Easy Lever 2.0 offers superior switching power for changing modes with a distinct click. Steel toe pins with grooves offer ice-breaking power to clear boot fittings for consistent performance. Generous flat-on-ski mode is accessible by turning the heel piece 90° for long approaches. Discrete leash attachment cables on the toe piece are solid and out of the way until you need them. Included Dynafit-compatible crampon receptors are optionally mounted under the toe piece. Update 2016/17: There are now three versions with differing spring-strengths: R08, R10, R12. Also the toe lever has been lengthened for easier jaw opening (2.0). Update 2017/18: Trab now offers optional adjustment plates and brakes that can be mounted under the heel pieces. Update 2018/19: A radical change: it's now called the "Titan Vario" instead of "Titan Release." I've been running race bindings on all my skis for a few years now. Plum race 150, ATK, Dyanfit low tech, etc. I've accepted the rigid attachment as opposed to the "surfy" feel of alpine oriented bindings. I was critical of these at first, the weight, size, and look is similar to that of bindings like the trofeo and race 150, but I was pleasantly surprised. The lateral elasticity is noticeable. It provides a different, better feel skiing, one more akin to larger and heavier bindings. While I haven't skied these enough to know for certain, I believe the individual movement of the toe pins should help with pre-release problems. I'm also curious about the potential forward pressure provided by the mounting plate, perhaps an even surfier ride? Do you think this toe piece has enough retention to work as a meadowskipping telemark tech system? Are toe pieces available separately? Hey Ted. These toe pieces are amazing, we have all grown to really enjoy them. That being said, none of these toe pieces were really designed to be telemarked on so it's tough to provide any clear guidance with personal confidence. Short answer: I'd ski it! Toe pieces are available here. I am considering these for my next skitouring setup. I weigh 160lbs, 5feet 11inches, intermediate skier. Which R number should I go for? Hey Stephan, thanks for reaching out! We're missing a few pieces of info so I would recommend filling out our Binding Finder to get a personalized selection. Fill out the specs and select the spring that closely resembles your release value, rounding up. How is the hole pattern on theese compared to the Dynafit Speed Superlite (the old, red one)? I want/need a flat mode - is it possible to swap bindings without compromising too much on the mounting point? Best regards from Erik, Norway. Hi Erik, the toe will be no problem, you can re-use the rear holes and drill new for the front. The heel will be a problem, the front holes are overlapping with the Superlite 1.0. 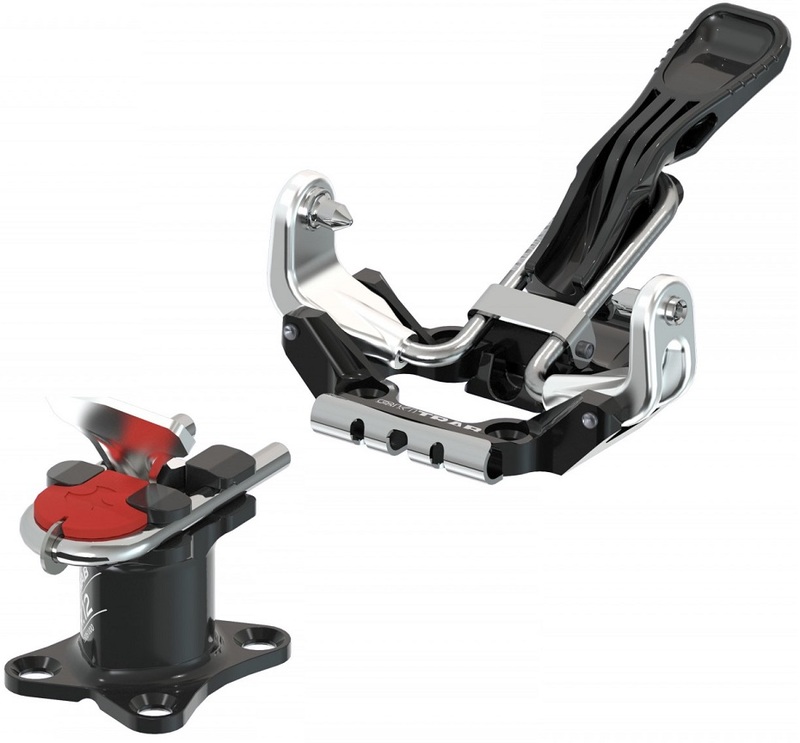 You can mount the heel on an adjustment plate or get the Adjustable version.